I often start out my seminars for retailers by asking participants to write a “tagline” or slogan describing their business. It should be ten words or less, and define makes your store unique. Taglines are more common in other fields of endeavor such as automakers (Ford: Built for the Road Ahead and Jaguar: Born to Perform); computers (Dell: Easy to Buy, Easy to Own) and insurance companies (Allstate: You’re in Good Hands). But they can also help gift retailers develop an identity, and avoid one of the most common mistakes in our industry: trying to be all things to all people. A good tag line provides a guideline that focuses the buyer’s decision on the most appropriate merchandise for the store, and helps create a cohesive merchandising look. As an example, Chiripa — a shop started by one of our former employees and her business partner — uses “Artisan Crafts of the Americas” as their tagline. No Beanie Babies here, or other fad items that would not mix well with their other products. But you’ll notice that “Artisan Crafts of the Americas” is broad enough to allow them to carry jewelry, cards, ornaments, rugs, pottery and much more . They are also not limited to just merchandise from Mexico, although that is their primary source of products. In addition to helping guide purchasing decisions, a tagline can be very useful in creating a brand identity. If, for example, the words you use to describe your store include the term “French country,” then your packaging, logo font and store decor should all be consistent with that image. 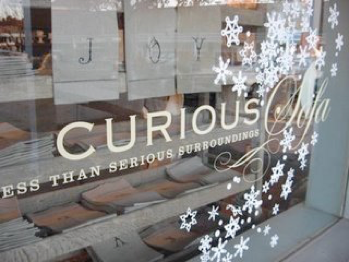 Another good example of a tagline comes from Debbie Dusenberry of The Curious Sofa, which is shown in the photo accompanying this blog entry. Debbie identifies her eclectic approach as “Less than Serious Surroundings,” and also describes her store as “a Kansas City-based retail boutique specializing in comfortable furnishings, uncommon objects and offbeat gifts.” No Beanie Babies here, either. It can be surprisingly difficult to write a tagline for your store, and in fact more than one business has held a contest to see if a customer or sales associate can come up with a clever yet accurate idea. (For some fun examples, look at this blog site.) You may not find one that you feel works well enough to use in your advertising — but I promise you that the exercise of trying to create a tagline will help you define what you want your store to be.